"You should split while you still can." Mechano-Lord Capacitus was a gnomish engineer in the service of Prince Kael'thas, and the Burning Legion. Using his skill in engineering and magic, Capacitus was tasked with using the naaru technologies of the Mechanar to produce manacells. These magic batteries were used by the naaru to power their technology, however Kael'thas saw that they could be used to contain magic that could be used to help feed his people's addiction. He piloted a large mech that he used both for safely handling dangerous amounts of arcane power, as well as for combat. Capacitus was killed by adventurers when they liberated the Mechanar from the blood elves. "Emperor Thaurissan does not wish to be disturbed! Turn back now or face your doom, weak mortals!" Magmus was a molten giant tasked by Ambassador Flamelash to guard the doors to Emperor Thaurissan's throne room. Thaurissan didn't feel that Magmus' presence was sufficient defence, however, and installed a series of fire breathing statues in the gauntlet as well. Magmus failed in his task, as he was killed by a hit squad of adventurers sent my King Magni to “rescue” his daughter from Thaurissan's “vile clutches”. "I cannot allow you to interfere!" Hydross the Unstable, the Duke of Currents, was a noble water elemental. He was enslaved by the naga, who tainted his watery essence with a vile poison which threatened to cause him to become corrupt and unstable. The naga were kind enough to purify him, with a pair magic columns that fired magic beams into him, enabling him to maintain his pure, stable form. Should he stray too far from them, however, he would revert to his unstable polluted form. This effectively left him trapped, unable to stray too far from where the naga wanted him to be. Making use of the enslaved elemental duke, Lady Vashj tasked him to guard the entryway into the Serpentshine Caverns. Adventurers destroyed him when they entered the Serpentshine Caverns, banishing him back to the elemental plane of water, the Abyssal Maw. It is unknown if this cured him of the poison that had tainted his essence or not. Sneed is rarely seen fighting without his shredder, but is just as capable of fighting without it. Sneed was a goblin lumbermaster in the employ of the Defias Brotherhood. Edwin VanCleef had hired him to help cut and shape the lumber necessary for the Brotherhood to finish refurbishing their ogre juggernaut in the Deadmines. Sneed was a skilled shredder pilot, and would first engage attacking adventurers in his shredder before engaging them himself. His shredder was the target of aggressive salvage by Shoni the Shilent who planned to use the power supply from his shredder to help power her gyrodrillmatic excavationators which she hoped to use in an assault on Gnomeregan, in an effort to reclaim it from the trogg menace. Sneed's shredder was ultimately defeated by adventurers. Sneed himself was killed, the power supply taken to Shoni, and the rest of the shredder was sold at auction to an anonymous buyer. Shoni's gyrodrillmatic excavationators were never used in the assault on Gnomeregan during Operation: Gnomeregan. Helix Gearbreaker, a goblin rogue, engineer, and carpenter, was hired by Vanessa VanCleef to serve as Sneed's successor when she reformed the Defias Brotherhood. Helix would go on to meet the same fate as his predecessor. Its web traps and prepares its food for devouring. Maexxna was a freaking huge spider who lived in Naxxramas. She was born in the depths of the mountains of Northrend, where she was one day captured and brought to Naxxramas where she now gives birth to new generations of spiders to serve the Scourge. "I will show you horrors undreamed of." Harbinger Skyriss was a qiraji prophet and servant of the Old Gods. Somehow, he had been captured by the naaru and imprisoned on board the Arcatraz, one of the satellite ships of Tempest Keep. He was safely contained therein, until the blood elves took over Tempest Keep and claimed the Arcatraz for themselves. Prince Kael'thas tasked Warden Mellichar with taking command of the Arcatraz, and ensuring that the dangerous creatures the naaru had imprisoned there did not escape. Sadly for Mellichar, he proved to be far more susceptible to Skyriss' influence than the naaru jailors had been. Mellichar soon fell under Skyriss' control, and the Arcatrasz fell to chaos. Adventurers later explored the Arcatrasz, and came across Mellichar, who tried to destroy them by releasing prisoners to kill them. This included When this failed, and the lowly gnome prisoner, Millhouse Manastorm defected to their side, he finally released Harbinger Skyriss, who promptly killed Mellichar and took the situation into his own hands. Er, appendages. Skyriss was defeated and killed by the adventurers, and Millhouse. Millhouse, likely due to Skyriss' influence, would later serve the Old Gods himself, by joining the Twilight's Hammer, where he helped to command the cult's operations in Deepholme, as The Forgemaster. As for Skyriss himself, he opened a terrifying can of worms, by revealing that the Old Gods, previously believed to be a phenomenon unique to Azeroth were, in fact, as countless as the stars. "What aggravation is this? You will die!" Thorngrin the Tender was a satyr warlock in the service of Prince Kael'thas, and member of the Nethervine satyr. He was likely a member of the Illidari before he defected alongside Kael'thas and his blood elves to the Burning Legion. He was an expert herbalist, and became a member of the blood elf crew of the captured naaru dimensional ship and satellite of Tempest Keep, the Botanica. On board the Botanica, he helped the blood elves by gathering the power necessary for them to continue their experiments in unlocking the secrets of the naaru. He mostly did this by sacrificing people. Thorngrin was killed by adventurers when they attacked the Botanica. "Pain and suffering are all that await you!" The Reliquary of Souls was a container of souls found within the Shrine of Lost Souls deep within the Black Temple. It's origins, and true purpose, are unknown. It's possible that it may have once been a draenic artifact, perhaps intended to serve a similar purpose as Auchindoun: to keep draenei souls safe and protected from the Burning Legion, only to have been corrupted and twisted by the Shadow Council when the Orcish Horde conquered Karabor. Regardless of its origins, the Reliquary currently contains and shepherds a host of souls, as the Shrine of Lost Souls lives up to its name. These souls, while they seem to be used to empower it, would also rise to the Reliquary's defence should need be. The Reliquary was driven by three Essences: Suffering, Desire, and Anger, possibly reflecting the nature of the souls it contained. Each Essence had powers of their own to defend themselves, and would emerge once the previous Essence had been defeated. Despite their best efforts, each Essence was defeated and the Reliquary was destroyed. "Face the souls of those your kind doomed to perish, Warlock!" From the remains of the Reliquary, a fourth Essence emerged: the Essence of Order. It was encountered by warlocks searching for the secrets of Green Fire. The Essence of Order was focused on defending the Shrine, and the souls and power it contained. These warlocks also discovered that the Shrine of Lost Souls contained a vast reservoir of pure, arcane power, capable of relieving anyone who drew on it of their own addiction to magic. Due to its similarity to the Well of Eternity, it is believed that this font of power was created by Illidan, who intended to use it to hold up his end of the bargain with Prince Kael'thas and cure the blood elves of their addiction to magic. However, for whatever reason, Illidan withheld this from Kael'thas and the blood elves, and instead used it to bribe a host of demons into serving him. Warlocks defeated the Essence of Order, and claimed the power of the Shrine of Lost Souls for themselves, storing as much of it as they could into an empowered soulcore. They couldn't stay for long, however, as in its death, the Essence of Order unleashed a horde of demons it had been previously holding at bay. A pet for every face! "The Horde will be brought to their knees by the Searing Blade!" Jergosh the Invoker was an orc warlock, member of the Shadow Council, and leader of the Searing Blade. He commanded the Searing Blade from within Ragefire Chasm, a large volcanic cavern underneath Orgrimmar. He had planned to assassinate Warchief Thrall, and then usurp control of the New Horde in the resulting confusion, and then return it to the old ways of demon worship, and serving the Burning Legion. Jergosh's ambitious plans were brought to an end when he was killed by adventurers. The Searing Blade has since been eradicated. Shortly after their demise, Ragefire Chasm became home to the Twilight's Hammer, and once they were driven out, a large portion of it became part of Warchief Garrosh's Underhold, his secret bunker hidden beneath Orgrimmar. 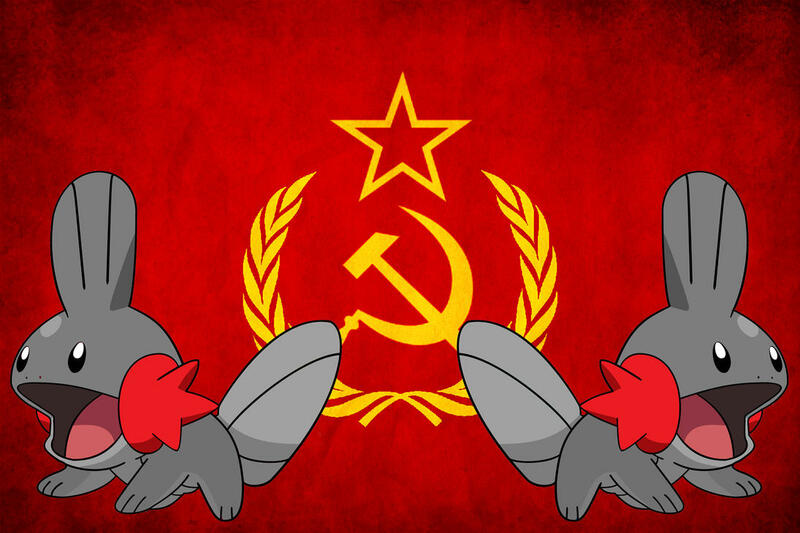 "You are defenders of a doomed world!" Anetheron is a dreadlord in the service of the Burning Legion. He personally served as one of Archimonde's lieutenants, ensuring that the Eredar lord's commands were obeyed. "Lord Archimonde has little patience for failure." During the Third War, he, alongside many of the other dreadlords, served as the Lich Kings jailers. He largely served as a courier between Archimonde and Tichondrius. 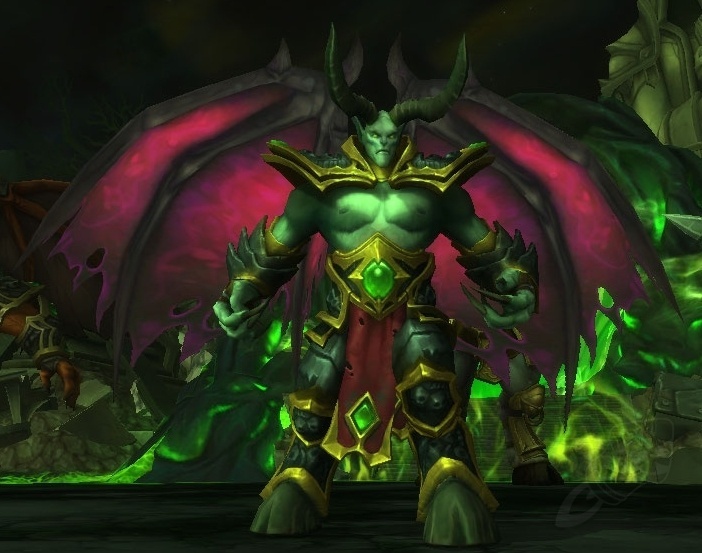 Following Tichondrius' death at the hands of Illidan, Anetheron was promoted to replace Tichondrius. He helped command the Scourge forces during the Battle of Mount Hyjal, where he was defeated by Jaina Proudmoore and the Alliance forces. Adventurers encountered him by travelling back in time to the Battle of Mount Hyjal, where they aided Jaina Proudmoore and the Alliance in defeating him. "The clock... is still... ticking." His alternate past, or perhaps present, self was later encountered in alternate past Draenor, serving once more as Arhcimonde's leiutenant. There, he was defeated again, while trying to prevent adventurers from interrupting the summoning of his master, Archimonde. It's hilarious how bad Azgalor looks when standing next to the new Kazrogal and Anetheron. No shiny new pit lord models yet? I thought they would have made one for sure with Mannoroth's skeleton hanging around. "My torture is ended, and now I can join the goddess." 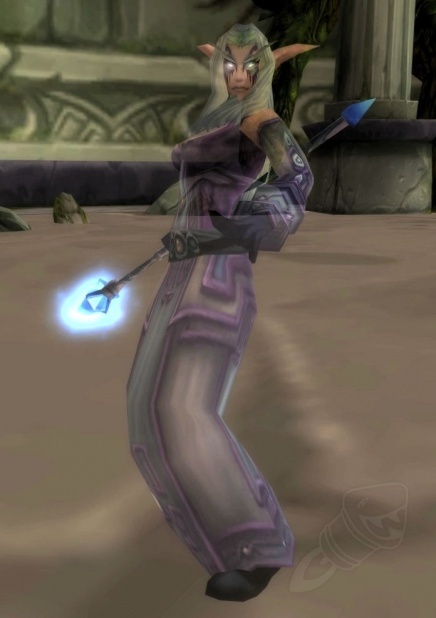 Isalien was a night elf, priestess of Elune, and a former member of the Veiled Blades Mercenaries. She left the party when the group disbanded after their assassination of Lord Valthalak. After leaving the group, she travelled to Dire Maul, where she had hoped to learn more of her night elven ancestry, and make use of the power stored within her fragment of Lord Valthalak's cursed amulet. While exploring Dire Maul, she ran afoul of Alzzin the Wildshaper, who killed her. Due to her possession of the cursed amulet, her spirit remained trapped within the ruins. Adventurers, possessing a Brazier of Beckoning, were able to summon her spirit and defeat it, claiming her fragment of the amulet. Freed from her curse, her spirit was released and found peace with Elune. "You no challenge me, scrubs!" King Gordok was the leader of the Gordok Ogres in Dire Maul. There must always be a King Gordok, as otherwise the ogres will rampage out of control and unchecked. Ulrok became King Gordok by convincing several of the tribe's best warriors to challenge previous King Gordok at once. Once they had weakened each other sufficiently, Ulrok swooped in, stole the kill, and took out several of his potential rivals in one move. His ascendency assured, Ulrok was no more, there was only King Gordok. The New King Gordok ruled for some time, until he was killed by an upstart band of adventurers. This band of five adventurers, now Kings Gordok, ruled the Gordok Ogres until they got bored and wandered off. Following their abdications, a New New King Gordok was chosen. "Don't value your life very much, do you?" Nethermancer Sepethrea was a blood elf mage in the service of Prince Kael'thas. She was the apprentice of Pathaleon the Calculator, one of Kael'thas' lieutenants, and served alongside her master on board the Mechanar. She likely oversaw the daily operations of the captured naaru vessel, allowing her master to focus his attention on more ambitious projects. She was killed by adventurers when they assaulted Tempest Keep and its satellites, in an effort to reclaim the stolen dimensional ships for the naaru.